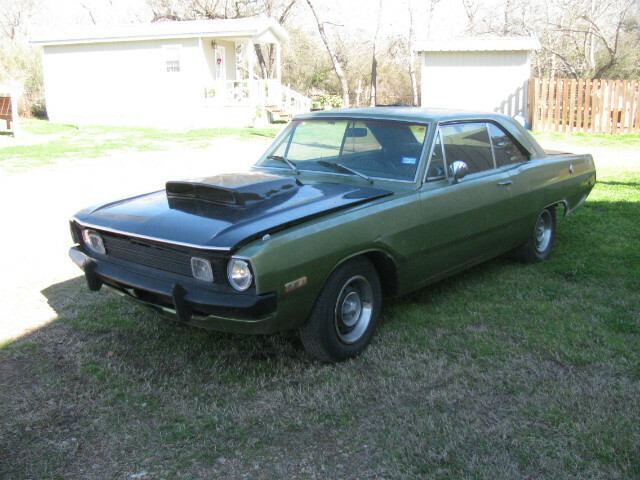 72 dart, was 6 cyl car, someone put a good running 73 dart sport 340 engine in it with the good X heads and a 727 automatic transmission. still has the small rear end. but rear seats are recovered, front buckets are recovered but not A body seats, lots of HP parts and lots of other interior things with car. This car is not running or driving and is being sold as a project car. It does have the original paint and is very solid with only outside minor body work needed. the frames, trunk and floors except one small patch in drivers floor are very solid and clean. This would be a solid car for someone wanting a cheap starter mopar. engine and trans. alone are worth what im asking. clear TX title.